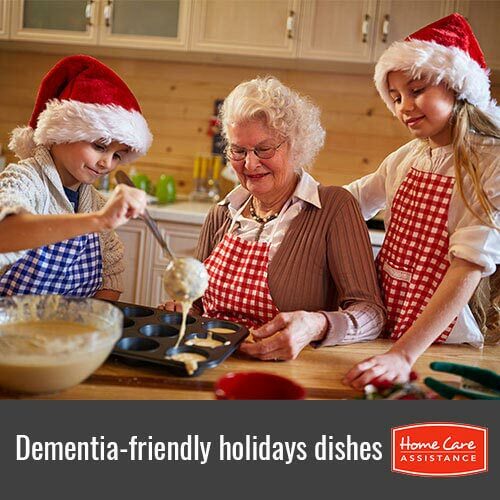 Cooking with a senior loved one with dementia can be a great way to spend New Year’s Day. There are some foods people believe eating on New Year’s Day brings them good luck. Incorporating them into a feast you prepare with your loved one can be great fun for everyone. Try some of the foods on this list, brought to you by the Rhode Island dementia care experts at Home Care Assistance. Have your loved one help you create a beautiful salad because people believe eating greens brings them money in the New Year. Try incorporating greens your loved one might not normally eat. People often eat beans on New Year’s Day because they also resemble coins. Therefore, have your loved one help you start a big pot of bean soup. Incorporate beans your loved one would not normally eat and learn about where they are grown. Some people believe eating noodles on New Year’s Day brings them extra good luck. Make a plate of spaghetti as your main course and let your loved one enjoy the tasty noodles. Eating grapes at midnight is considered to be good luck. Though grapes are great when eaten by themselves, consider making some grape thumbprint cookies for dessert. Eating pork for New Year’s is thought to bring good luck because pigs are always using their snouts to root forward. Fry up some bacon and add it to your salad or make a sauce for your noodles using ground pork instead of hamburger. Round cakes are seen as a sign of coming full circle. Help your loved one make one of these tasty desserts. You will both enjoy the experience. Focusing on a day filled with fun food activities can be fun for both you and your loved one. Everyone will enjoy spending the time together and you both should have great luck throughout the coming year. Make sure your loved one has opportunities all year long to engage in mentally stimulating activities. At Home Care Assistance, our caregivers can provide the mental and social stimulation your loved one needs and deserves while helping with tasks like cooking, exercise, and bathing. For more information on the elder home care Rhode Island families trust and rely on, call a Care Manager at (401) 284-0979 today.